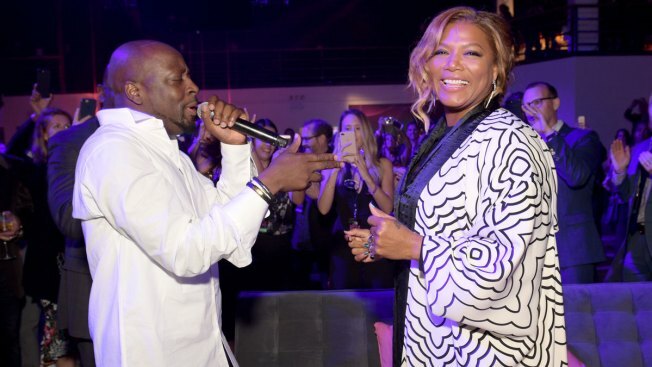 Wyclef Jean sings to Queen Latifah at VH1 Save The Music 20th Anniversary Gala at SIR Stage37 on October 16, 2017 in New York City. "Latifah is family. She's magical. She's been responsible for so many people's careers including the Fugees. People don't know that," he said. "Latifah put the Fugees on tour before the Fugees were the Fugees. She sees greatness. I love her for that." Before the event Latifah also chimed in on the #MeToo movement that has spread across social media as women share their stories of sexual harassment and abuse. "I think it's very important that women speak out as much as possible and the men. Men have been through this too you know. It's a culture that needs to change and it needs to start at the top like with our president," she said. "It's an attitude adjustment that needs to happen." Other honorees included DJ Khaled and record producer, DJ, and music executive Steve Aoki who received the Music Innovator Award. Since its founding in 1997, the Save the Music Foundation has donated $53M worth of new musical instruments to over 2,000 public schools in 251 school districts in the U.S.